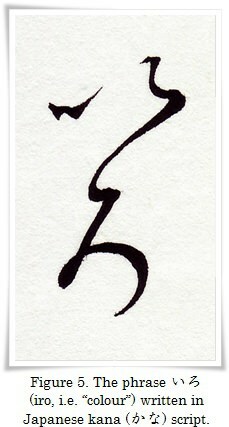 The modern form of い comes from the cursive form of the kanji 以 (い, i, i.e. “by means of”, “because of”, etc.). Follow the different scripts shown in Figures 1 to 3 to understand its origin. Figure 1. Standard script (楷書, かいしょ, kaisho) of kanji 以, calligraphy by 品天龍涙 (ぽんてりゅうるい, Ponte Ryūrui), ink on paper. Figure 2. 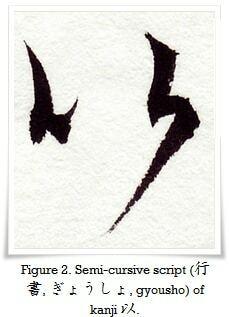 Semi-cursive script (行書, ぎょうしょ, gyousho) of kanji 以, calligraphy by 品天龍涙 (ぽんてりゅうるい, Ponte Ryūrui), ink on paper. Figures 3. Cursive script (草書, そうしょ, sousho) of kanji 以, calligraphy by 品天龍涙 (ぽんてりゅうるい, Ponte Ryūrui), ink on paper. Figure 4. Calligraphy of hiragana character い. 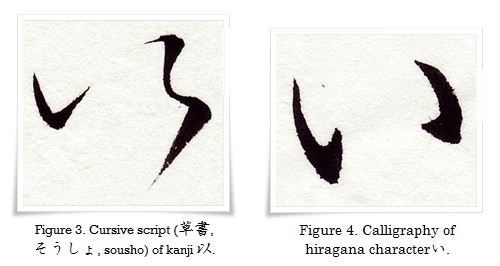 Note the corresponding shape with cursive form of the character 以, especially in Figure 3. Calligraphy by 品天龍涙 (ぽんてりゅうるい, Ponte Ryūrui), ink on paper. Figure 5. The phrase いろ (iro, i.e. “colour”) written in Japanese kana script (かな). 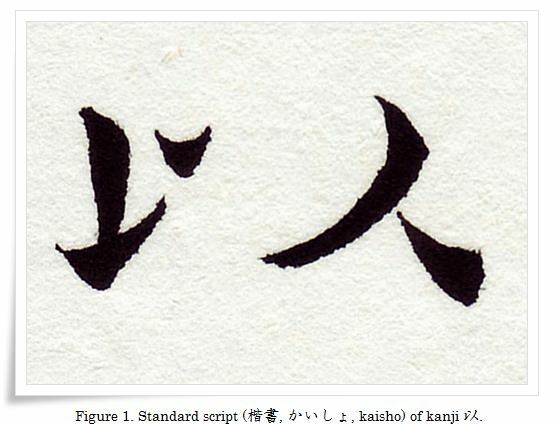 The hiragana character ろ is based on the cursive form of the kanji 呂 (ろ, ro, i.e. “spine”, “backbone”, etc. ), which will be explained in our next article. Calligraphy by 品天龍涙 (ぽんてりゅうるい, Ponte Ryūrui), ink on paper. ← 平仮名 (ひらがな, hiragana): あ (i.e. "a").